It seems that Saber has learned from the mistakes of the past. 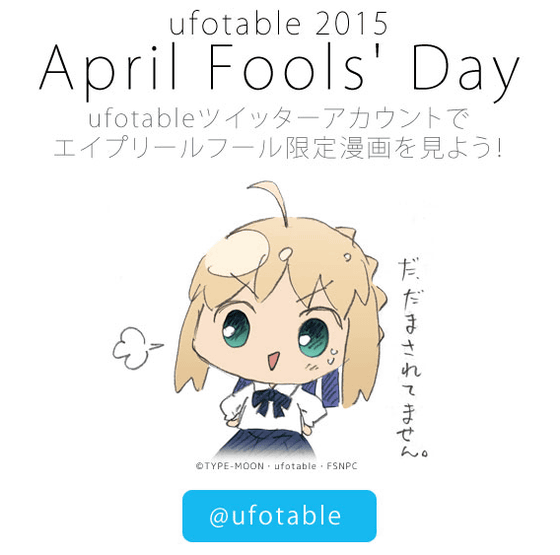 Once again it was April First so Type-Moon went all out. They did another Twitter event but the amount of surrounding material was far more complex. I have tried to get as many links to Type-Moon related events as I can here. If I missed any just let me know so I can add them in. Lost in Translation: The J.The.E has some great links that saved parts of the event with even some links to the translations. Idol Talk: Crunchyroll News points out some of the events during April 1st with some great pictures from Nero’s talent agency. Invasion of the Patriotic Heroes: The Fate Grand Order page got a bit of a face life on the first. Fundoshi Metal Panic: Good Smile got in on the action with some familiar faces getting a special addition to their Nendoroids. We are the Champions: Capsule Servant became a little more Pokemon than it already was. Bad to the Shakespearean Bone: Apparently Bad Quarto got in on the action as well. The Ultimate Servant: Saber-nyan has arrived. Heaven’s Feel is getting a manga adaptation in Young Ace magazine presumably as a tie in to the movies that are coming out. When I first saw this article I thought the first movie was coming out on May 5th which seemed a bit too soon. The cover for the Carnival Phantasm Complete Edition box set has been revealed. The first Unlimited Blade Works Box Set is doing quite well. As the first episode comes out today it only makes sense that the commercials for the second half of Unlimited Blade Works are pouring out. While I don’t think anyone was worried it is good to know that Crunchyroll will also be streaming the second half of Unlimited Blade Works. Comp Ace celebrated its 10th anniversary with some art in the accompanying illustration book which included the Type-Moon titles currently running in the magazine. Some more Type-Moon related ads on the street. Rin is now a card in Lord of Vermilion III. It seems that someone other than Saber can get some love from time to time.